The purpose of this study was to developed microemulsion based gel formulation for topical delivery of dapsone with an objective to increase the solubility and skin permeability of the drug for treatment of acne. The solubility of dapsone in oils, surfactants and cosurfactants was evaluated by saturation solubility to screen the components of the microemulsion. The pseudoternary phase diagrams were constructed using capryol 90 and N-methyl-2 pyrrolidone as the oil phase, Kolliphor EL as surfactant and PEG 400 as the co-surfactant. The system were assessed for drug-loading efficiency and characterized for pH, conductance, viscosity, particle size, drug content, globule size, zeta potential and drug release. Optimized formulation systems were formulated into gel form by using poloxamer- 407 and evaluated for viscosity, spreadability, drug content, stability, in-vitro skin permeation, steady state flux, permeability coefficient, enhancement ration and skin irritation study. Globule size of optimized microemulsion (F2) was found to be 27.53 nm, zeta potential was found to be-14.6 mV, permeability of drug from microemulsion within 8h was observed 82%, In- vitro diffusion study showed increase in flux of microemulsion based gel (392.43 µg cm-2 h-1) to that of simple dapsone gel (274.4 ± 0.78 µg cm-2h-1). 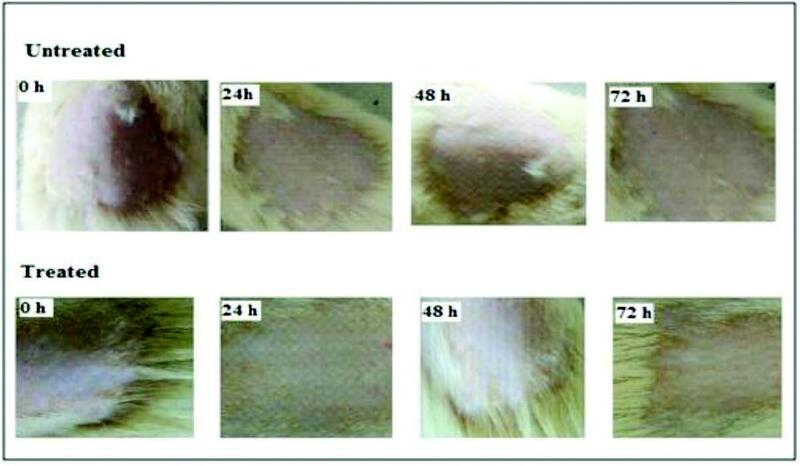 Draize test revealed absence of irritation and inflammation on rat skin. Microemulsion based gel of dapsone formulation provided better application property and stability in comparison to simple gel. Therefore, dapsone has been introduced in the management of acne. Dapsone has longer half-life, with least side effects and interactions with other drugs and safety in pregnancy.5 Dapsone (4-[4-aminobenzene) sulfonyl] aniline) is an antimicrobial agent with bacteriostatic action. It inhibits the synthesis of dihydrofolic acid by competing with para-aminobenzoic acid for the active site of dihydropteorate synthetase, thus resembling the action of sulphonamide.6 The mechanism of topical dapsone in treatment of acne vulgaris may result from a combination of both anti-inflammatory and anti-microbial effects.6,7 Dapsone is a BCS class II drug with low aqueous solubility.8 Oral administration of dapsone has several side effects, including hemolyticanemia, nausea and headache. Adverse effects of dapsone are related to the production of metabolites. In the liver dapsone is acetylated by N-acetyltransferase which produces monoacetyldapsone, and upon enzymatic hydroxylation, dapsone hydroxylamine is produced, that is primarily responsible for the development of adverse effects.9 These side effects diminish its practicability to use it by the oral route for treating skin diseases. Because of unsuitability of dapsone for the oral route; topical route is another alternative. Dapsone is marketed as gel; the bioavailbitliy of dapsone can be improved by incorporating drug in microemulsion based gel. Microemulsion as colloidal nanosize carrier system is a promising vehicle for topical administration of drug with poor water solubility. Microemulsion had demonstrated improved transdermal permeation, thermodynamically stable over conventional topical preparations such as gel, cream and ointment. Microemulsion acts as penetration enhancer by interacting with stratum corneum, changing structural organization of lipid layer and consequently increasing transdermal drug permeation.10,11 The viscosity played an important role in promoting the drug retention on the stratum corneum and viable epidermis. However, microemulsion had very low viscosity and cannot retain at the affected area. Retention time of microemulsion can be increased by adding gelling agent. Some of the gelling agent such as carbapol, HPMC K-15, poloxamer-407 have been selected to increase the appropriate viscosity of microemulsion to enhance skin permeation, retention and form microemulsion based gel to improve topical applicability. In the present study attempt was made to formulate microemulsion based gel of dapsone using oil- 6%, Smix- 32%, Water-62% and poloxamer 407-18% w/w as gelling agent. Prepared gel was characterized for pH, viscosity, percent drug content, spreadability and in- vitro diffusion study. Dapsone was purchased from market. Capryol 90 provided as gift sample by Gattefosse India Pvt. Ltd., Mumbai, India. Kolliphor EL and Polaxomer 407 were provided as gift sample by BASF, Mumbai, India. N- methyl-2 pyrrolidone, PEG 400, Carbopol 934, Carbapol 940 and HPMC K100M were purchased from Research Laboratory, India. All other chemicals and reagents were of analytical grade. Composition of microemulsion formulation prepared with Smix ratio. Where, Cv is the total donar concentration of the solute. Solubility of dapsone in various solvent. Being a BCS class II drug dapsone has very low solubility in water. The saturation solubility of Dapsone in distilled water was found to be 0.24 ± 0.056 mg/mL and in methanol was 49.76 ± 0.68 mg/mL. Because of poor water solubility, solubility of dapsone in the oily phase of microemulsion is very critical because it may affect the stability as well as the percutaneous delivery performance of the formulation. 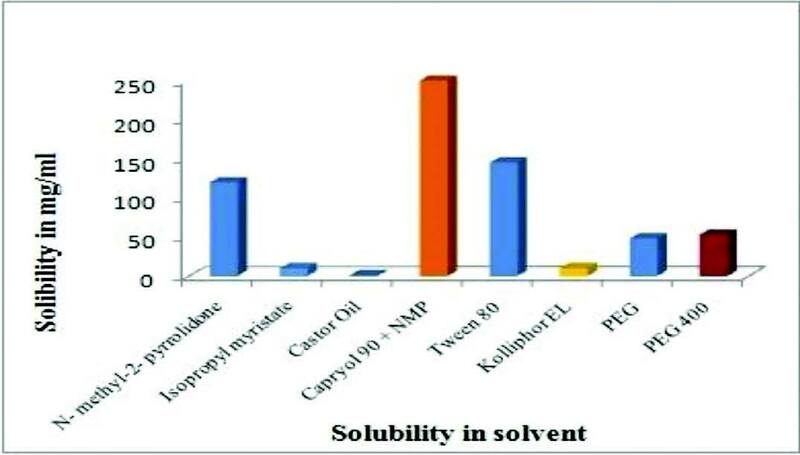 To screen appropriate solvents for the preparation of microemulsions, the solubility of dapsone in various oils, non-ionic surfactants and co-surfactant was measured Figure 1. The solubility of dapsone in N-methyl-2 pyrrrolidone was 120 mg/mL but solubility of dapsone in blend of Capryol 90 and N-methyl-2 pyrrrolidone was 250 mg/mL. Use of N-methyl-2 pyrrolidone provided a greater microemulsion region and higher solubilization of Dapsone. So, to improve the solubility of dapsone the blend of N- methyl- 2 pyrrolidone + Capryol 90 (1:1) was used. Amongst the various surfactants and cosurfactants screened, dapsone exhibited good solubility in nonionic surfactants such as Tween 80. Though dapsone was showing less solubility in Kolliphor EL than Tween 80, it was decided to select kolliphor EL further study as it was giving better transparent region in pseudoternary plot. The phase diagrams of Capryol 90+ N- methyl- 2 pyrrolidone+Kolliphor EL+ PEG 400+water was shown in Figure 2. The transparent o/w microemulsion area was presented as a shaded region in the phase diagrams. The Smix ratio 1:1 had larger microemulsification region as compared to 1:2 and 2:1. The emulsified area was the lowest at ratio of 2:1 as the concentration of co-surfactant was less. From the microemulsion regions in the phase diagrams, the microemulsion formulations were selected at different component ratios. The microemulsions containing excess amount of drug were prepared and evaluated. The effect of amount of surfactant: cosurfactant and oil phase on globule size of drug‑loaded microemulsions were investigated. Pseudo-ternary phase diagram showing microemulsion region of oil, water and Smix (Kolliphor EL: PEG 400) with different ratio of Smix (surfactant: Co-surfacant) A 1:1, B 1:2, C 2:1. Data for evaluation of different microemulsion. [i] * Mean ± SD; n=3, Microemulsion marked as Turbid (-), Slightly turbid (+), Clear (++), Clear and transparent (+++). In-vitro drug permeation dapsone loaded microemulsion through dialysis membrane. Microemulsion had pH values from 5.8 to 6. pH of all these formulations were in the range of pH of skin (4 to 7). The conductance of microemulsion formulations was measured using conductometer. It was observed that as the percentage of water was increased in microemulsion, the electrical conductivity also increased. The conductance of microemulsions was found in Table 2 the range of 14-16 (microsiemens/cm). Estimation of dapsone content in microemulsion formulation was carried out by the UV spectrometric method. The content of dapsone in various microemulsion was found to be in range of 80- 100%. Percent transmittance in microemulsion formulation was carried out by UV spectrometric method at 630 nm. The percentage transmittance of dapsone microemulsion formulations was found to be in the range of 97-100%. Droplet size of microemulsion formulation is critical parameter. The smaller the droplet size, the larger will be interfacial surface area provided for drug permeation.21,27 Globule size of (F2) formulation was found to be 27.53 nm Table 2. The viscosity of optimized microemulsion (F2) was found to be 120 cps at 100 rpm which was determined by using Brookfield viscometer (DV II + PRO) with small sample volume adaptor. Zeta potential of optimized microemulsion (F2) was found was found to be-14.6 mV. Figure 3 represent the cumulative percent drug permeated from the formulation F1 to F6 in 6 h through dialysis membrane shows that drug permeation greatly depends on the composition of microemulsion. After 6 h of permeation study through dialysis membrane, amount of drug permeated (72.20%) was maximum for F2 formulation. Data for evaluation of different microemulsion based gel. In-vitro drug permeation dapsone loaded microemulsion based gel through dialysis membrane. The pH of all the microemulsion based gel formulation was found to be in the range of 5.8-6.2. These pH values were considered to be acceptable since the skin pH ranges between 4-7. Although good spreadability was observed for all the formulations, the formulation gelled with polaxomer - 407 showed better spreadability in range of 14- 30 gm/cm/sec. Estimation of drug content in microemulsion based gel formulation was carried out by UV spectrophotometer. The content of dapsone in various microemulsion based gel was found to be in range of 80- 97% Table 3. Drug content study revealed that no degradation of drug was observed when formulated as microemulsion based gel. Viscosity of all gels was determined by Brook filed viscometer by using spindle S- 94. Viscosity of all gel at 20 rpm was found to be FG1-32890, FG2-48500, FG3-78900, FG4-30300, FG5-33000 and FG6-65200 cps. Stability testing of FG2 after 15 days interval. Comparison of in-vitro drug permeation of plain dapsone gel and microemulsion based gel through rat skin. The results of in-vitro diffusion study of microemulsion based gel through dialysis membrane using Franz diffusion cell are shown in Figure 4. Among all the microemulsion based gel formulations, formulation FG2 (Oil: 6%, Smix: 32%, Water: 62%) showed good permeation rate through dialysis membrane (70 ± 0.09%), spread easily and it was found to be stable formulation and hence was selected as optimized formulation. The result of stability study Table 4 revealed that there was no significant change in the microemulsion based gel formulation, no phase separation and no sign of precipitation of drug. Stability studies indicated that the preparation was stable at room temperature over the period of one month. Ex-vivo skin permeation study showed higher drug release for microemulsion based gel (81.51 ± 0.42 %) as compare to simple gel of dapsone (58.98 ± 0.36%) at the end of 8 h Figure 5. This might be due to decreased globular size of microemulsion droplets (F2- 27.53 nm). 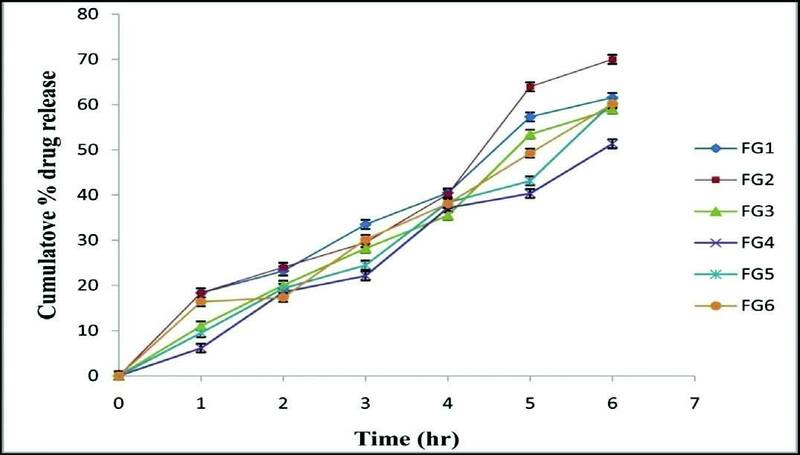 The cumulative amount of drug released from selected dapsone microemulsion and microemulsion based gel formulation at different time interval was fitted to different models to find out the mechanism of drug release. The correlation coefficients Table 5 showed that the kinetic of drug release from microemulsion and microemulsion based gel followed zero order model of kinetics. The permeability parameters of different formulations are given in Table 6. Flux is the amount of drug permeated per unit area in unit time. The results showed that the optimized microemulsion formulation when gelled with poloxamer-407, the flux (Jss) and permeability coefficient (Kp) was greatly increased as compared to simple dapsone gel. At the end of 8 h microemulsion based gel showed flux of 392.43 ± 0.814 µg/cm2/h and cumulative drug release was found to be 81.51 ± 0.42%. Increase in flux as compare to simple dapsone gel with highest enhancement ratio (Er) 1.430, which indicates faster drug release from microemulsion based gel. Release Kinetics of microemulsion and microemulsion based gel. Skin irritation test for microemulsion based gel of dapsone on rat skin. Frequent use of some topical formulation can induce irritation and damage the skin. Therefore, skin irritation studies are developed for topical formulation. Treatment groups not showed any signs of skin irritation as reddening and inflammation at the site of application. Skin of rat was found to be free of any signs of irritation Figure 6. Thus it can be concluded that all selected microemulsion based gel of dapsone are safe for topical application. Capryol 90 + N-methyl-2 pyrrolidone as oil phase (1:1) and Kolliphor EL + PEG 400 as the Smix for microemulsion showed better transparent region, because dapsone has good solubility in these solvents, which helped to get the transparent region in pseudo-ternary phase diagram. It was evident from the results that the droplet size is inversely proportional to the concentration of Smix and directly proportional to concentration of oil. A decrease in particle size with increase in Smix may be the result of more non-ionic surfactants (Smix) being available to solubilize the oil/water interface. Sticking of particles to each other (aggregation, coagulation and flocculation) or to the surrounding surface causes microemulsion instability. Sticking can be counteracted by strong electrostatic repulsion and the strength of that repulsion can be measured by the zeta potential. Negative zeta potential showed that globules of microemulsion had no charge, the system was stable. It was observed from the result of viscosity measurements that viscosity values of all microemulsion formulation were increased slightly with increase in concentration of Smix. Conductivity studies showed that addition of the appropriate amount of water phase into the formulation had no negative effects on system stability. In an unstable microemulsion system the conductivity values were reduced because of phase separation. Good spreadability is because of the loose gel matrix nature of microemulsion based gel. Increase in shear causes alignment of random molecules of gelling material thus decreasing internal resistance of material. The pH range for skin is 6-8. Measured pH values of all formulations were found to be compatible for topical formulations. Higher percent drug permeation of F2 formulation was might be due to change in concentration of oil, Smix and water. Smaller particle size of F2 formulation permeated better drug as compared to other formulations. It has been shown that release rate from microemulsion based gel was higher as compared to simple dapsone gel. Greater permeability of drug from microemulsion based gel may be attributed to different factors, such as a) microemulsion with reduced particle size provides more surface area to release drug, thereby increase the rate of drug release, and b) various components of microemulsion also have penetration enhancing effect. 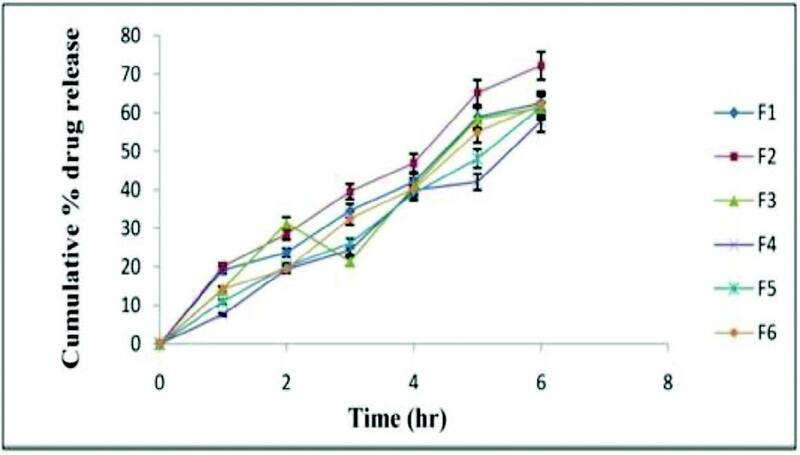 The study revealed that microemulsion based gel prepared with Poloxamer-407 (18%) as a gelling agent imparts viscosity to the preparation to sustain the action of the drug by increasing the residence time. The contents of the microemulsion based gel was composed of Dapsone (1% w/w), N-methyl-2 pyrrolidone- Capryol 90 (1:1), (6% w/w), Kolliphor EL (32% w/w), poloxamer-407 (18% w/w) and water (62% w/w). The increased permeability of dapsone microemulsion based gel was observed 81.51 ± 0.42 % within 8 h compared to simple gel 58.98 ± 0.36%%. There was no change in drug content, in-vitro diffusion study of the microemulsion based gel after 30 days of stability testing. Conclusively, microemulsion based gel could be one of the approach to enhanced the solubility and to improve permeability of dapsone.